Remember in elementary school, when your teacher had the box with the mesh screen on top and the see-through plastic walls where the caterpillars hung out? Yeah, It must have been kindergarten or first grade for me. But also remember the word that was constantly repeated during that learning experience (and was displayed prominently on the pocket chart)—metamorphosis. At the time, I had no idea that this word meant anything outside of biology (or for that matter butterflies). 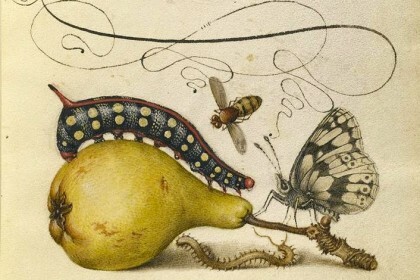 It was just the name for the change that occurred when a caterpillar transformed into some new form (morph); a butterfly. However, digging into the Greek of the New Testament we encounter the word metamorphoo. This word is the basis for the English word we learned in elementary school. For the evangelists, the word took on a spiritual meaning. When we encounter it in Mark and Matthew's gospels, it is found in the account of Our Lord’s Transfiguration on Mount Tabor (Matt 17:2, Mark 9:2). In most English translations of scripture, metamorphoo is often translated as transfiguration rather than metamorphosis. Perhaps this is because of the connotation of metamorphosis with biology. Thus, we call the mystery of Christ as the Transfiguration and not the Metamorphosis, though arguably, it could called as such. Transformation is another English word that metamorphoo is often translated to, though it doesn’t quite convey the weight of the mystery as well as transfiguration. Strong's Greek concordance suggests that metamorphoo literally means to "change form after being with" something "while keeping an inner reality". This sounds very much like what the Church Fathers call Theosis or Deification. Hold it! Deification? This is starting to sound like Mormonism. No, no, I promise we don’t “become gods” in the way the Latter Day Saints believe. St. Thomas Aquinas says: ”The only-begotten Son of God, wanting to make us sharers in his divinity, assumed our nature, so that he, made man, might make men gods.” God is not bequeathing us powers because we were good. No sir, it is God’s own presence that indwelling within us, raises us up from corruption and to eternal life. It is by God's hypostatic life within us, that makes us gods. This mystery of faith is the mystery confessed in the Incarnation, and is fully realized in the Transfiguration. In His Incarnation, God showed His love for us by taking up our present life. 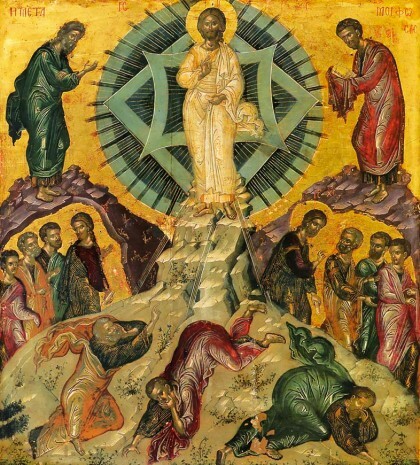 In the Transfiguration, Christ shows us what our life is intended to be. The Divine light that shown from Mount Tabor, is the Light of lights, the presence of the Eternal God. Christ showed the apostles His true nature to demonstrate that this was His normative condition, but because many were unprepared to see the Eternal Light (in the fact the apostles themselves were initially bewildered according to the evangelists), Christ did manifest this light during His ministry. This same nature was shared by Adam and Eve in the garden, but because of their fall, mankind lost this. Humanity had broken its relationship with God, and because we knew not what a relationship with God was like, it took God becoming one of us to show us. "I am the vine, you are the branches; he who abides in Me and I in him, he bears much fruit, for apart from Me you can do nothing." (John 15:5). If we do not enter into a hypostatic relationship with God, we are nothing. For apart from God, we have nothing. We have only a shadow of life, for God is the author of life. Just like the caterpillar, we are called to begin our own metamorphosis, which for all of us began at our baptism when we rejected the rule of the devil. Our path toward holiness is our metamorphosis, our transfiguration; and it will be fully realized as we arrive in paradise. But in order to fulfill our purpose and reach our aim of life, we must seek God (2 Peter 1:3). For it is in Him we are fulfilled. So pray, fast, be charitable, and acquire the Holy Spirit, and you too will shine like the sun.